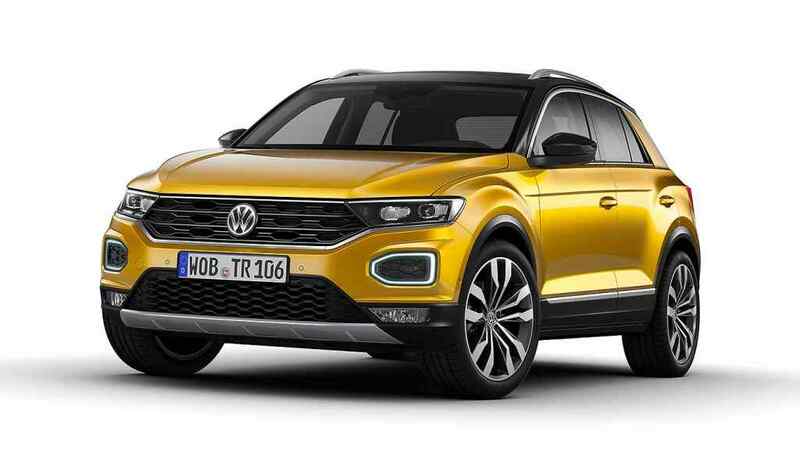 The new Volkswagen T-Roc is VW’s long-awaited rival to the Nissan Qashqai crossover SUV, a model that it believes “sets a new benchmark in the booming SUV segment”. Ordering begins in September 2017 and European deliveries will start in November. Volkswagen punchily says the T-Roc will compete in the €20,000 class in Germany: while it’s unlikely to have a starting price from £18,500 in the UK, it will still go head-to-head with the Nissan on price. Pleasingly, the new T-Roc has very distinctive styling that’s a real contrast to the sober, discreet Golf it’s derived from. Bulging, sharp-edged wheelarches, flowing roofline and a very distinctive front end are all certain to ensure it stands out within an ever-growing sector; for once, Volkswagen hasn’t watered things down from previous exciting-looking concepts. 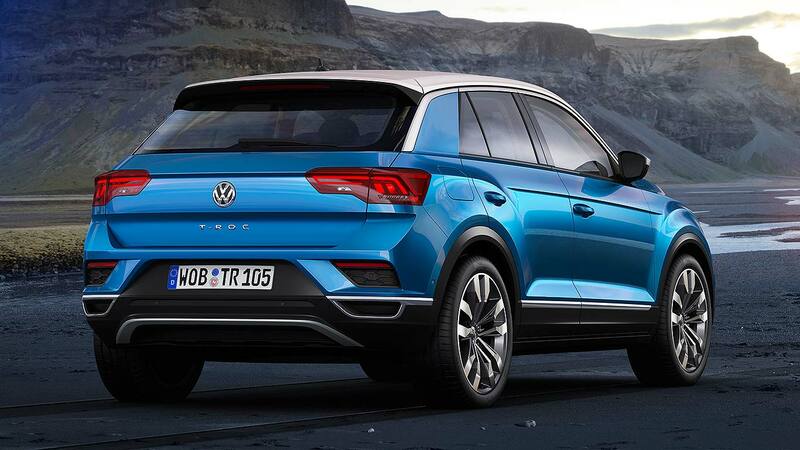 This should help Volkswagen snare a strong share of the huge small SUV market, which it predicts will grow from 6.4 million units today, to a whopping 10.6 million by 2027. It’s going to be sold globally, with the focus on Europe and China because almost 80 percent of small SUVs are sold. Volkswagen says that, along with Tiguan, Touareg and the not-for-Europe Atlas and Teramont, the T-Roc completes its SUV range (for now, at least). 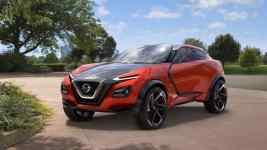 The name itself is interesting, too: the firm cheerily admits it’s been derived from the word ‘rock’… before telling us it “really rocks the segment – sometimes louder and sometimes more subdued”. Cringe. 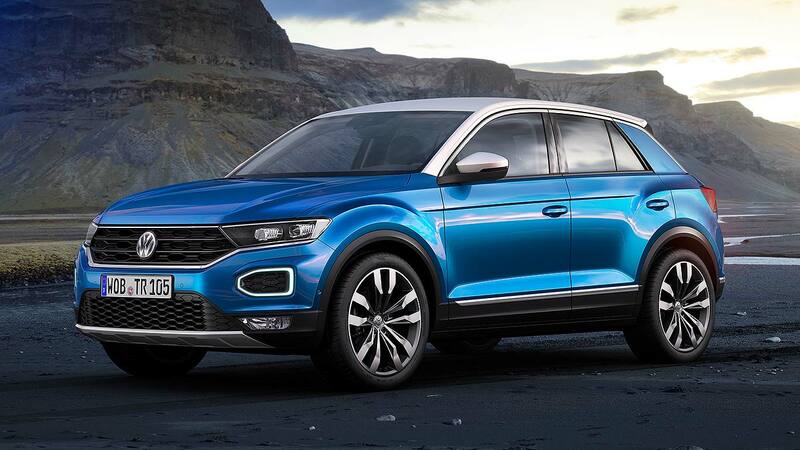 The new Volkswagen T-Roc is, at 4,234mm long, 252mm shorter than the Tiguan. It’s 1,819mm wide and 1,573mm tall. The boot is 445 litres with the seats up, 1,290 litres with them folded, which Volkswagen’s calculator suggests is “one of the largest luggage compartments in its class”. 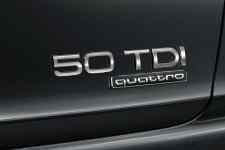 Six engines will be offered: 1.0 TSI 115, 1.5 TSI 150 and 2.0 TSI 190 petrols, 1.6 TDI 115 and 2.0 TDI 150 or 190 diesels. The lower-power ones are front-wheel drive, with 4Motion available on the punchier ones. Six-speed manual or DSG autos, too. It’s pretty much as per the Tiguan. Volkswagen is pleased as punch with its new trim range, which it says follows the Arteon in comprising a ‘Y’ structure: basically, base, then either a stylish or a sporty one, with roughly equivalent equipment levels. In the UK, it’s likely to deploy Elegance and R-Line badges respectively for these trims. All models get a 6.5-inch touchscreen, with posher variants getting an 8.0-inch glass-covered setup. 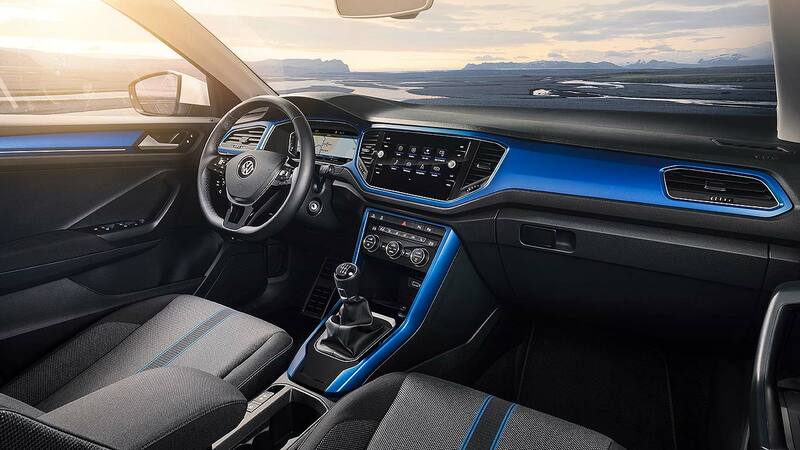 Volkswagen’s latest virtual instrument binnacles will be optional: it calls them ‘new generation Active Info Displays’. The 300-watt Beats premium audio system should go down well with the kids, too. 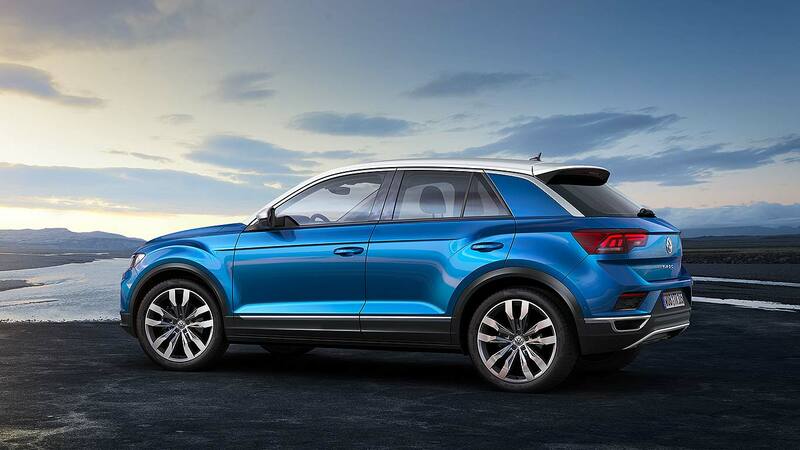 And if you want to make your T-Roc even more distinctive-looking, you’re in luck: the ‘style’ trim (that’s Elegance, remember) will have a bi-colour design as standard, offering a choice of three different roof colours. 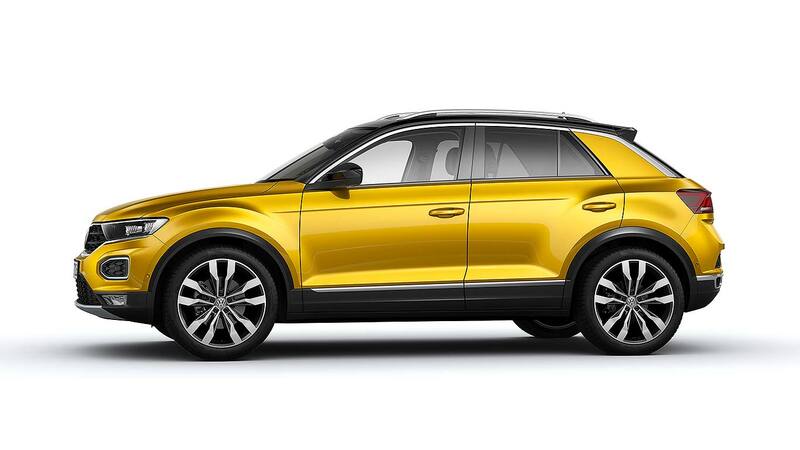 A decided break from the traditional Volkswagen past, and sure to be a popular, standout choice. You can’t get contrast roof colours on a Qashqai now, can you?